We love all venues for weddings, but we are suckers for marriage celebrations set in old ballrooms and theaters. On a personal level, we have a keen appreciation for history. It is one of the things we enjoy about living in the Nation’s Capital! On a professional level, we feel that these older locations lead to some great matrimonial photography. Inside these structures, there is a sense that that the settings have seen and experienced a lot over the years. We always wonder what stories the walls would tell if they could talk. More importantly, there is often an eternal atmosphere in wedding venues like that. That appeals to us considerably as DC wedding photographers. We like being able to take pictures of brides and grooms that look and feel timeless. Images that could have been captured today or 80 years ago really appeal to us. In our opinion, they speak to the notion that love is forever. They give the sense that the newlyweds’s love story transcends time, that they were always meant to be together. It is for this reason that the Andrew W. Mellon Auditorium is one of our favorite Washington, DC, wedding venues. 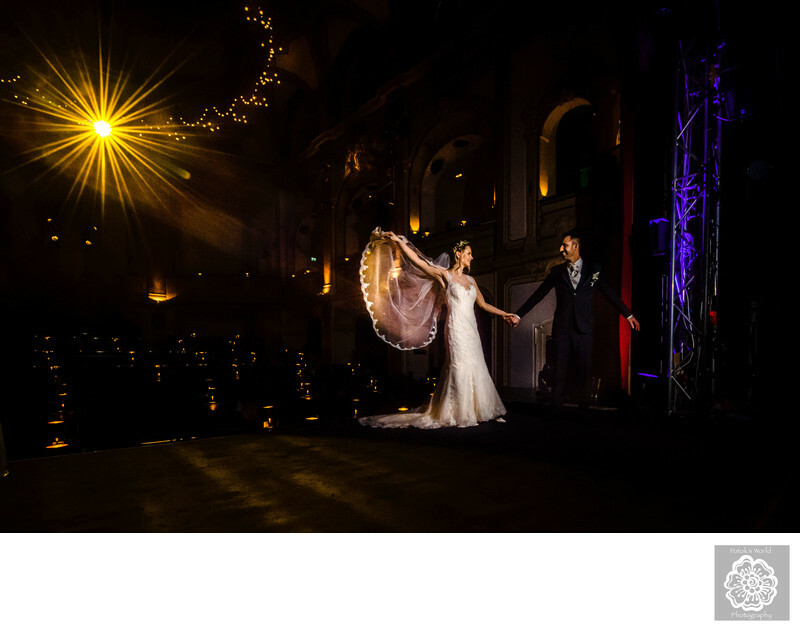 Its Great Hall, in particular, is a classic and timeless spot in which brides and grooms can wed. A massive ballroom capable of fitting up to 1000 wedding guests, the Great Hall looks like it could have hosted marriage celebrations at any time in American history. Its huge stone columns and gorgeous wood flooring are elegant and classical, turning any wedding into a classy affair. More importantly, they look and feel permanent — like they have always been there and always will. For a Washington, DC, wedding photographer committed to communicating the timelessness of love, this makes it a perfect setting for a marriage celebration. Though actually a former casino, the edifice that houses the GOP Varieté Theater was built in a similarly grand style. It is called the “Kaiserpalais,” indicating that it was meant to be opulent enough to serve as a ruler’s residence. The Kaiserpalais is a sprawling building with two low-slung wings meeting at a gorgeous dome in the center. To these DC wedding photographers, it looks a bit like a combination of Washington’s Union Station and Hannover’s Neues Rathaus. The building’s front facade is a perfect spot for wider-angle portraits of brides and grooms. The grandeur of the Kaiserpalais behind them makes it look like theirs was some sort of royal wedding. As beautiful as the building’s exterior is, the real highlight of the venue is the theater space on the inside. Its luxurious table seating is capable of accommodating up to 345 wedding guests. From the comfort of plush chairs, they can witness brides and grooms exchanging their vows on a large, elevated stage. The GOP Varieté Theater’s excellent technical staff can light the event in whatever way the future spouses want. If you have ever dreamed of being the star of your own wedding, this venue can literally give that to you. We wanted that look and feel for the couples portraits of these particular newlyweds. They tied the knot in a glamorous ceremony up on the main stage. After the guests departed the theater to enjoy cocktail hour, we brought the bride and groom back in for their portraiture. Our idea was to use the theater setting to make them look like celebrities who had just gotten married. We had them stand back up on the stage and asked the venue staff to hit them with a spotlight. We closed the apertures on our cameras to turn that light into a starburst pattern. To introduce a little dynamism into the images, we asked them to dance a bit. Given that the bride had been a dancer, this seemed like a wise choice. At one point, the groom spun his new wife away from him, and she stretched out her other arm. They looked so graceful and elegant at that moment that we knew we had our shot. We press our camera’s trigger and got the image you see here. The kind of picture than any Washington, DC, wedding photographer would be proud to deliver to their clients. Location: GOP Varieté-Theater Kaiserpalais Bad Oeynhausen, Im Kurgarten 8, 32545 Bad Oeynhausen, Germany. Keywords: DC wedding photographers (48), Germany Destination Wedding (3).